John Kasich is earnestly running for president, perhaps blissfully unaware of just how deeply he violated his party’s moral code. As governor of Ohio, Kasich accepted the Medicaid expansion that is part of the Affordable Care Act, thereby providing medical care to some half-million Ohioans. Worse still, Kasich framed his decision not just as a concession to his state’s budgetary needs but as a matter of conscience. The exchange left many stunned. Around 20 audience members walked out of the room, and two governors also on the panel, Nikki Haley of South Carolina and Bobby Jindal of Louisiana, told Kasich they disagreed with him. The Ohio governor has not been invited back to a Koch seminar — opportunities for presidential aspirants to mingle with the party’s rich and powerful — in the months since. 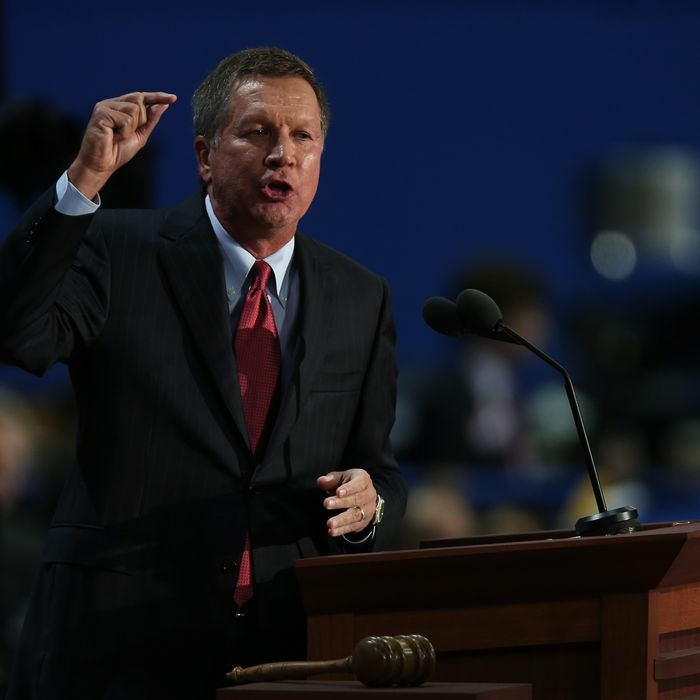 It’s worth contemplating just how deeply Kasich’s heresy runs. Conservatives disagree about the optimal health-care policy they would implement in a world without political constraints. The closest a Republican can come to insisting upon the need to provide some alternative to Obamacare is to insist that repealing the law is not enough, that the party must put in place an alternative plan as well. A Republican can argue that their alternative plan is better than Obamacare, and that their alternative plan is better than the pre-Obamacare status quo. The thing you cannot say, and remain a Republican in good standing, is that Obamacare is better than the pre-Obamacare status quo. But that is the fissure Kasich exposed. As a governor, the choice he faced was not the hypothetical one that Republicans prefer, between Obamacare and an imagined Republican plan that doesn’t impose costs on anybody. His choice was whether to accept the Medicaid expansion or let poor Ohioans suffer. He chose the former. And he defended his choice by stating that the alternative is cruel and barbaric. Obscuring the moral basis of that actual real-world choice is the whole basis of contemporary Republican policy-making. If you’re sitting around the back room of the Bada Bing club and you suggest maybe shifting some operations out of racketeering and into stock scams, you’re probably okay. If you just come out and say that beating people up and stealing their money is immoral and you won’t do it, they’re not going to pick you to be the next head of the family.